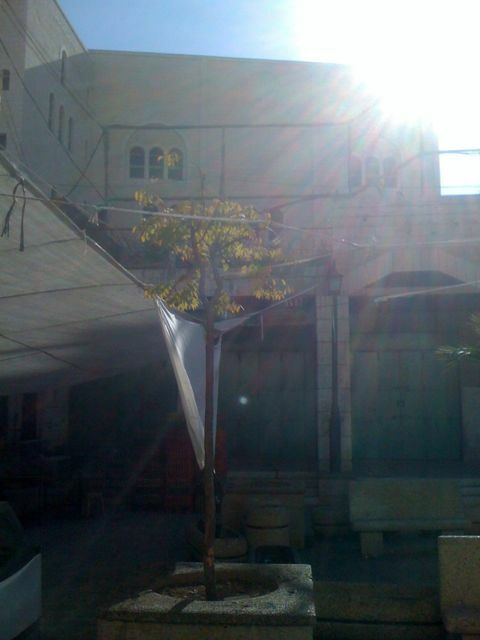 There are many websites giving the political and religious background to Hebron. Suffice it to say: about 500 Israeli settlers living in the middle of an old Palestinian city, near sites both Jews and Muslims believe are sacred. First, I was somewhat surprised to encounter a real, live Palestinian city, which like Bethlehem or East Jerusalem, has an outskirts of tire shops, etc. along the entrance road, a new city, and an old city. In the new city cars jam the streets and the concrete four to eight story buildings hold shops selling cell phones, clothes and food. The police and soldiers one sees, like in Ramallah or Bethlehem, are Palestinian Authority. My surprise came because I had read about how empty, divided and depressing Hebron was. I was interested to find that this description, and it is completely accurate, refers to a specific part of the city – the old city and several major streets near it. As I saw it today Hebron (or al-Khalil in Arabic) really exists in three forms: the new city described above, much of the old city, and a closed neighborhood that used to be a major market street. The old city lives a kind of half-life. 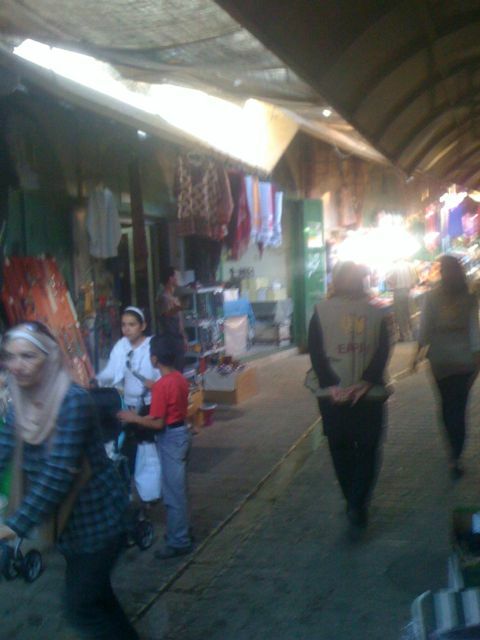 I walked through most of the old city without crossing an Israeli checkpoint, though video cameras, guard towers and pairs of soldiers at street corners were common. The old city also now has earned the distinction of being the place I first encountered a genuine combat patrol – i.e. seven soldiers, spaced apart, on either side of the street, constantly sweeping their eyes in all directions. They were followed by two women with the World Council of Churches Ecumenical Accompaniment Programme in Palestine and Israel (international observers always wisely wear identifying clothing). 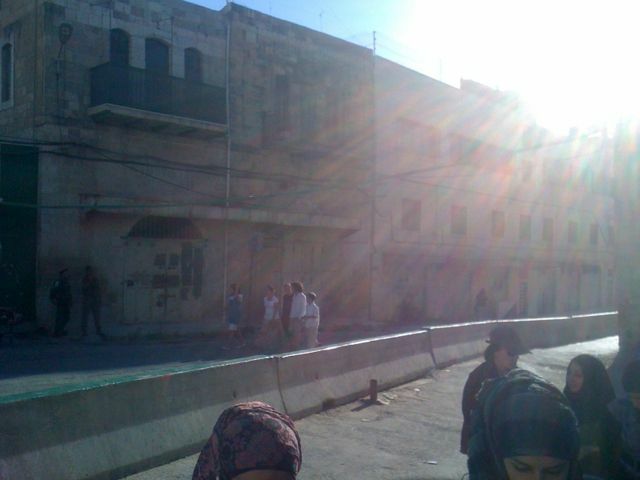 All Israeli soldiers I saw today in Hebron wore their helmets. For context, so far in a month of visiting the Old City of Jerusalem I cannot recall seeing an Israeli soldier wearing his helmet. Some shops were open, though the closer we got to the Ibrahimi Mosque more and more were closed. Some areas had metal gratings across the top of the street, because settlers living above, I was told, throw garbage down on the Palestinians in the street. Near the mosque we went through a checkpoint like those along the security fence / wall – turnstiles with the guard out of sight, a green and red light to signal when you can go through, and then a metal detector. (You only see the soldiers after this procedure.) We then emerged out of the old city and into a ghost town. This is what I had read about. 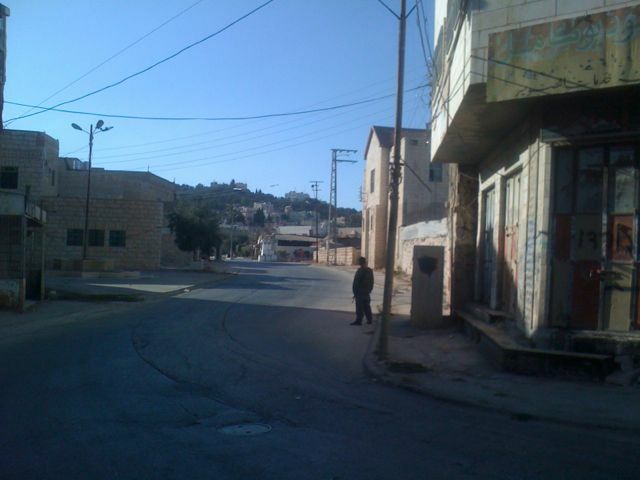 Some people still live there – we saw kids in windows, and the occasional Palestinian walking from one point to another. But these are large streets with three story buildings, major intersections and a large parking lot – all with no cars, every shop shuttered, and checkpoints at every entrance. I would guess it is about three blocks wide and very long, stretching up to another checkpoint. As I was passing back through the checkpoint I saw perhaps the strangest sight I have yet come across in this region – a nicely, casually dressed observant Jewish family came walking around a corner. My neighborhood in West Jerusalem, of course, is full of families dressed this way. I was prepared to see angry settlers with guns, but this happy family walking down this post-apocalyptic wasteland of a street was absolutely bizarre.